Take our Canton location and multiply it by a Scunsonian, Elvis Booth, and Bar! Like our Big Sister…similar relics grace the walls in themes of Baltimore Colts, Orioles and Natty Boh. 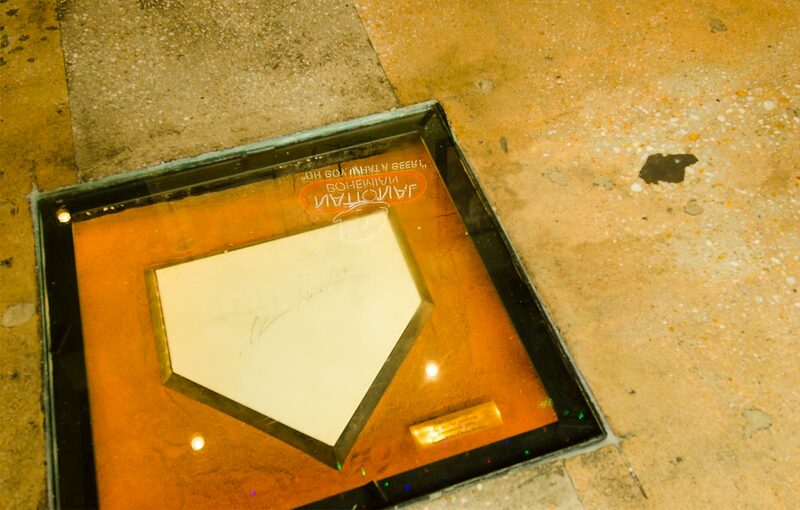 Walk in and over a Home Plate from Memorial Stadium signed by Chris Hoiles. There’s so much more, but we won’t give it all away…gotta find out for yourself! 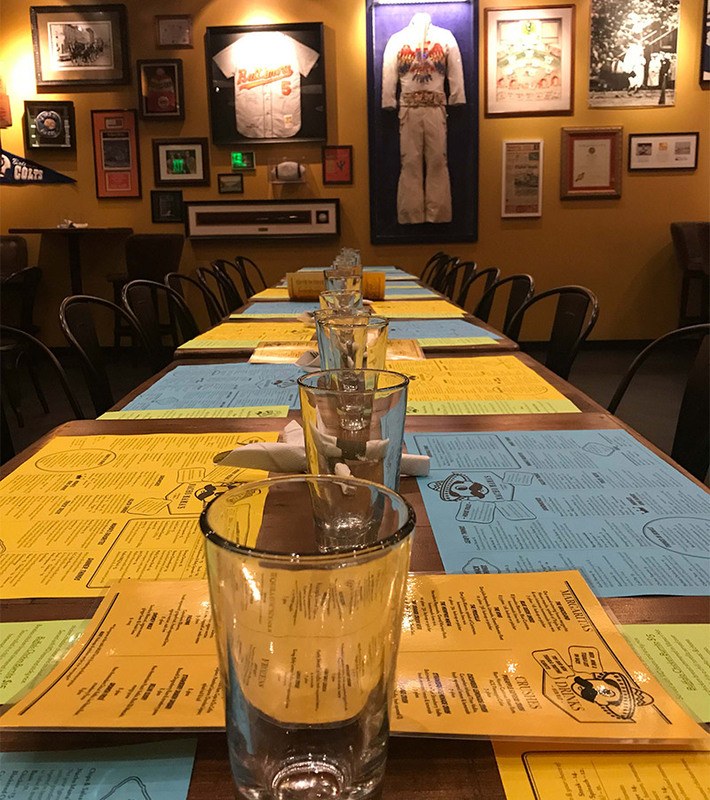 Host your next event at Nacho’s Towson SCUNSONIAN! Old school Bawlmer memorabilia adorn the walls with some added Elvis flair! A perk of the room is a resin poured private bar filled with small pieces of Baltimore History including Cal Ripken’s 1st paycheck when he signed with dem’O’s. Whether you’re celebrating a Birthday, Holiday Party, small intimate affair or corporate gathering, this is the room for you! We offer custom menus to meet your individual needs. Please contact us at events@mamasmd.com for more information. Now that they have an amazing happy hour my partner and I are here at least once a week! Bartenders are on point and the chicken tacos are ACE. Live music and large portions to accompany the hubcap margarita! Accommodating to gluten allergies. Great evening out with friends! Always great. Service was exceptional! Loved the taco truck tacos. Will probably be back mañana! I’ve been to nacho mamas several times since it opened in Towson and have been impressed each time. I’ve gotten several different things on the menu and have always been pleased, but this last time I took a chance and ordered the jambalaya. Wow! It was spicy, but not too much, and the flavor of the sausage, tender chicken, and shrimp with rice was delicious. A nice portion, too. Had a lovely and pleasurable dining experience at Nacho Mama’s in Towson. This kitschy establishment with a Tex-Mex/Elvis theme has excellent food and is fun. We arrived early ish on a Saturday evening with a two-year-old and the restaurant was similarly filled with families and children of all ages. Crayons and a coloring mat quickly appeared as well as a terry cloth bib which we were told was ours to keep! The menu is extensive and there are many vegetarian options. We had no trouble ordering, the portions were large, and the food was delicious. The children’s menu had ample selections and the quesadilla that was ordered came in a frisbee, which we were also told was ours to keep. Either way the food is delicious and I suggested a visit. Came here before a movie on a Saturday evening. Was able to sit a party of 5 immediately. Staff was friendly. Everyone loved their drinks. I got the blue suede shoes margarita (ok I got 2 ) and it was lit and I ordered the blacked chicken nachos. They were amazing. I loved the spice on the blackened chicken, and the portion was enough for 4 people. I’d definitely go back! This was our first trip to the Towson location. The place looks great and is far roomier than the Canton location. We were seated within a minute of asking for a table. Drinks were served quickly, our orders were taken and arrived correctly. Our server, Carly, was pleasant and attentive, keeping an eye on our drinks and stopping by to check up on us. The food is just as good as I remember at the Canton location. Great service, great food. Will definitely come back again. Trying to contact Nacho Mama’s in Towson?